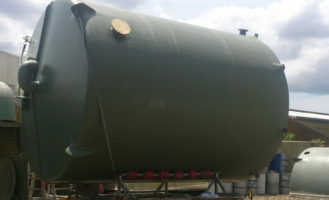 "We're Australia's trusted manufacturer of custom-made FRP chemical water treatment tanks"
Ajay Fibreglass Industries specialises in the supply of high quality Chemical Tanks. Each tank can be designed, drafted and engineered independently to meet the required and relevant Australian standards and is subjected to rigorous testing at various stages of manufacture. This ensures that very high quality products are produced every time. The Ajay group of companies is certified to meet the requirements of ISO9001:2008. 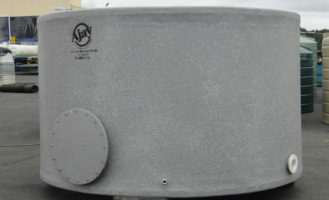 Our low profile chemical/treatment tanks are manufactured using the latest Vinyl Ester resin systems and barrier coat technologies, and are used mainly for water treatment plants and industrial applications. Each tank is specifically designed and manufactured to suit the chemicals to be stored and the relevant conditions. A comprehensive range of flanged FRP outlets and backing rings, inspection manhole (side and top entry) , level indictors and mixer mounts are available and quoted on request. A complete engineer design and certification service is available to comply with the relevant Australian standards. These high profile chemical tanks are manufactured using the latest Vinyl Ester resin systems and barrier coat technologies, and are used mainly for water treatment plants and industrial applications. Each tank is specifically designed and manufactured to suit the chemicals be stored and the relevant conditions. A comprehensive range of flanged FRP outlets and backing rings, inspection manhole (side and top entry), level indictors and mixer mounts are available and quoted on request. A complete engineer design and certification service is available to comply with the relevant Australian standards. Our tapered tank range is most commonly used where the settling of solids is a problem. 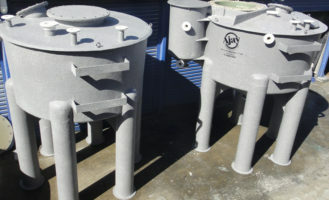 They can be manufactured as a standard tank or supplied as a clarifier or separator design. These units are supplied mainly to water treatment plants, local councils or heavy industrial applications. Each tank is specifically designed and manufactured to suit the chemicals be stored and the relevant conditions. A comprehensive range of flanged FRP outlets and backing rings, inspection manhole (side and top entry) , level indictors and mixer mounts are available and quoted on request. A complete engineer design and certification service is available to comply with the relevant Australian standards.